The Ying Yang Day Bed from Norfolk Leisure's popular Handpicked Range is a luxurious outdoor rattan day bed set that not only looks great, but is practical super comfy and very low maintenance. 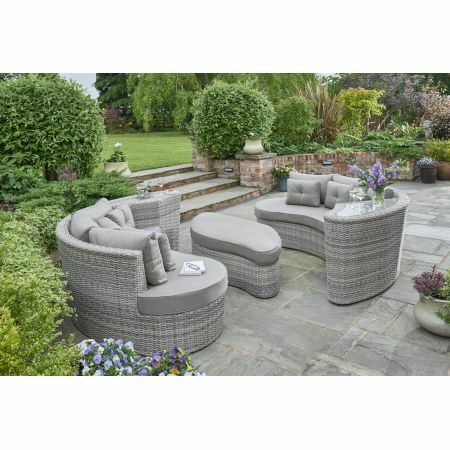 This stylish garden day bed set is made with a high quality double half round grey weave woven onto strong, rust free aluminium frames. Featuring elegant curves, and luxuriously thick cushions, each component interlocks to form your own personal outdoor haven for pure relaxation. Alternatively, choose to use the day bed as sofas and you have the perfect furniture for socialising outdoors. This rattan garden day bed set includes 1x Left Sofa with Side Table, 1x Right Sofa with Side Table and 1x Centre Stool. Supplied with Grey colour polyester cushions. Write a review about "Ying Yang Day Bed"